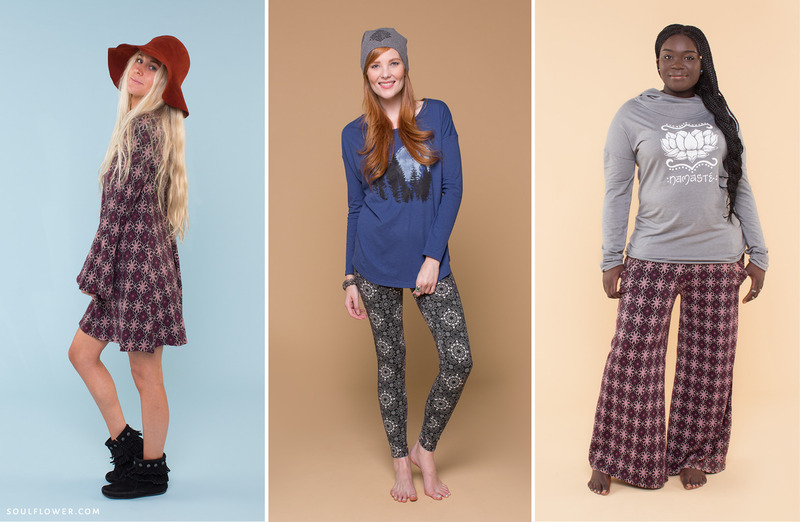 The collection features 5 styles in 3 patterns each, for a total of 15 brand new items! The fabric is 95% GOTS Certified organic cotton and 5% spandex, and dyed with low impact dyes. Everything is certified Fair Trade, so it’s eco-friendly and ethical– our specialty! Flare sleeves and an open tie back! Double criss-crossing strappy back and comfy elastic band for support. 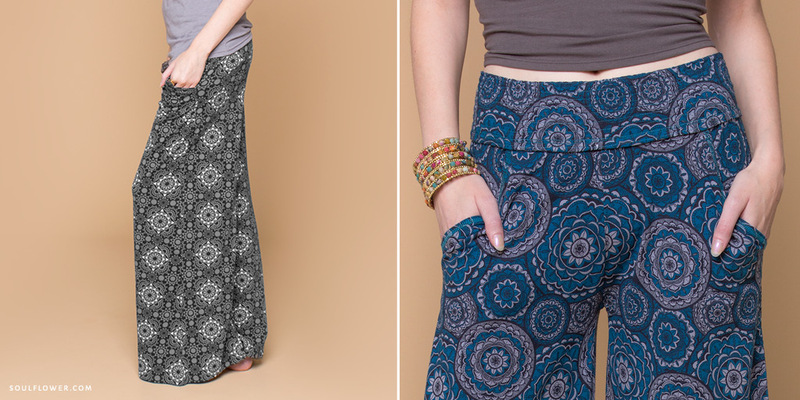 Wide legs, smocked waistband, and front pockets. 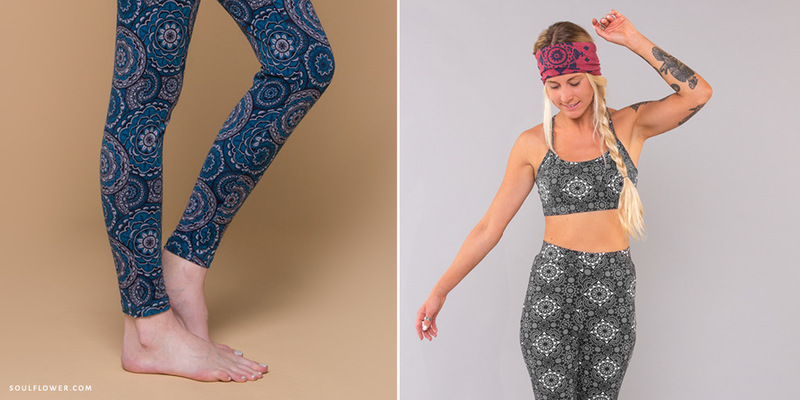 These are our first ever patterned leggings! High-rise fit. Has a moveable knot around a comfy double-lined band. 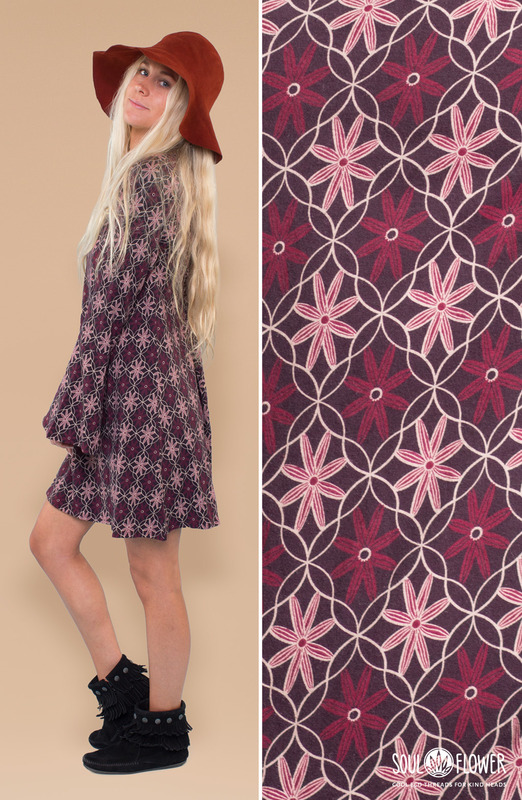 The prints were inspired by all things retro and funky, but we modernized them so they feel fresh and on-trend. We kept the colors classic and super wearable, so you can seamlessly integrate them into your wardrobe. 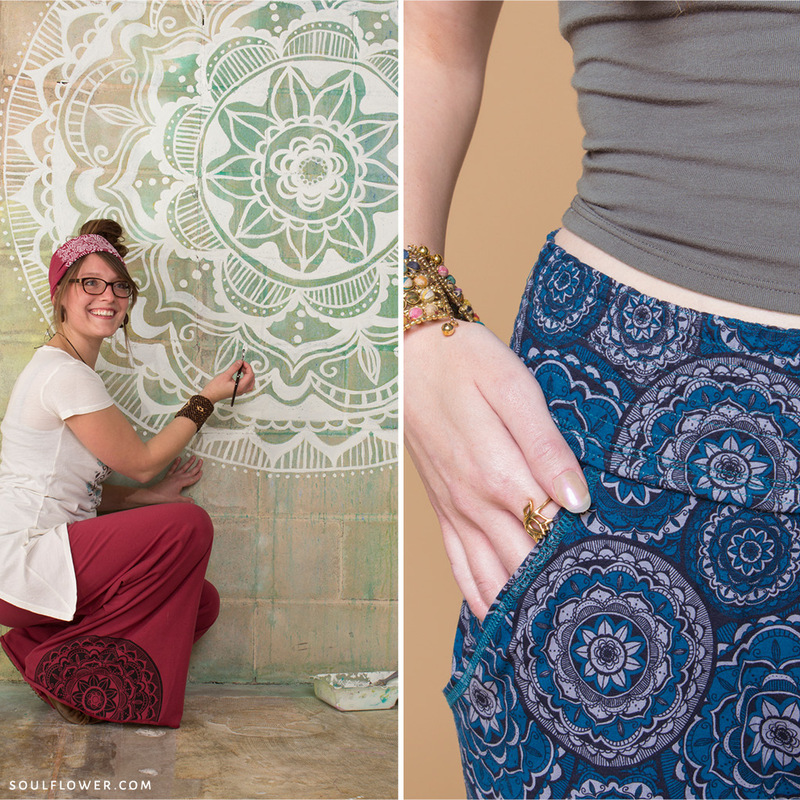 Fun fact: the Mandala print uses a hand-drawn mandala that we’ve screenprinted on items before. Obviously it’s one of our favorites! It’s also painted on the wall of our warehouse in Minnesota. 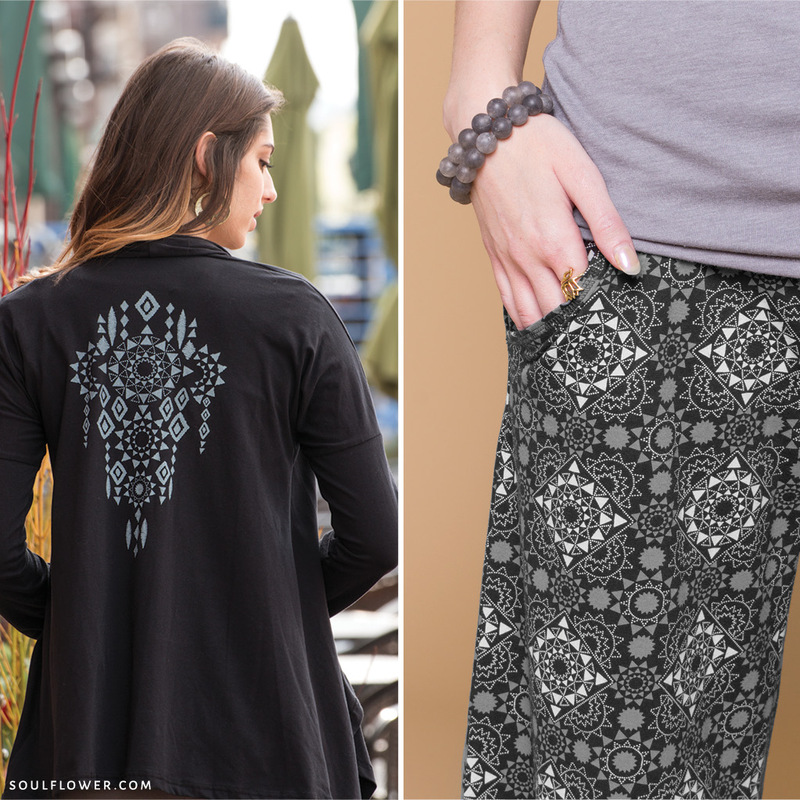 And we loved the Dark Star print so much, we repurposed the shapes into designs for a couple other garments (Rising Sun Flowy Pants, Draped Cardigan). A perfect pairing! 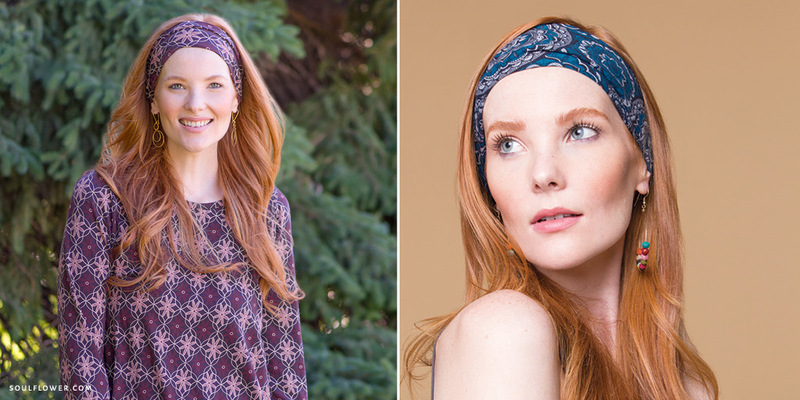 1 Comment on Happy Daze Collection: New, Organic & Fair Trade! I absolutely love these patterns however I can not pin it down to what item of clothing I like the best because I like all of them especially the dress and the pants. 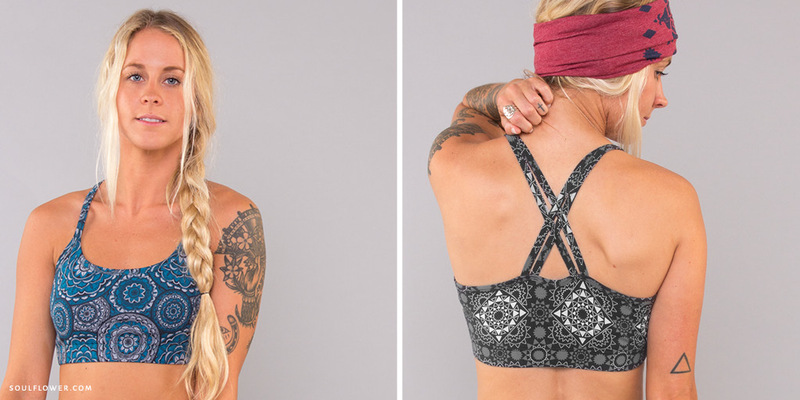 The bralette is very cute too! I like the dress in the black and white pattern. I wish I had had it back when I was teaching school in Utah because they need their feathers ruffled on occasion and the children would have loved it! That is what counts the most! Right! Children are the future of our planet.